Thanks for joining our mobile site! Each mobile should be able to move, to stir, to oscillate, to come and go in its relationships with the other elements in its universe. It must not be just a “fleeting moment”, but a physical bond between the varying events in life. Nature is inherently 3- dimensional because the building blocks of life (alpha-amino acids, nucleotides, and sugars) are chiral and appear in nature in mirror image forms (enantiomers). This area of study is fascinating due simply to the aesthetic beauty associated with chemical structures, and the intriguing ability to combine the fields of geometry, topology, and chemistry in a study of three- dimensional shapes. 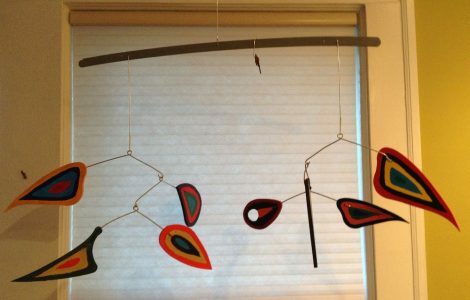 In a related manner, mobiles (or kinetic sculptures) are examples of kinetic art which bears a strong resemblance to the structure of complex organic molecules. In common with other types of kinetic art, kinetic sculptures have parts that move or that are in motion. Clearly there is a lot of symbolism between mobiles and complex molecular structures in 3-D dimensional space.